Keeping fit while traveling can be a challenging task due to lack of facilities and time, depending on if your trip is for business or pleasure. Often times work doesn’t allow for lots of free time and recreational trips often consist of relaxing and indulging, leaving your workout schedule to an after thought. Whether you’re a gym rat such as myself or just don’t want to loose your progress while away from home, there are some simple ways to keep on track. Personally I book hotels with the appropriate facilities however, if this is an issue packing, gear for a morning run or sneaking a kettlebell or TRX into your luggage can do the trick. Even if the pressure to work or play is intense, make a plan to get up before your friends/coworkers and sneak a morning jog in. Another trick I use is doing pushups/squats etc in the morning before everyone else gets up. Kettlebells are suitable for swings, snatches and cleans but can also be used for traditional excersises you might usually do with a Dumbell. 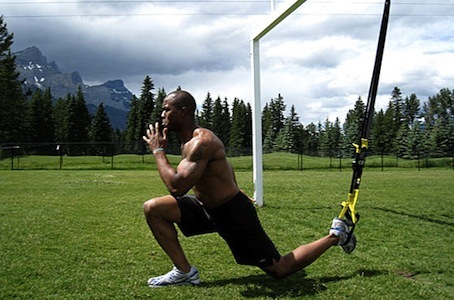 TRX wIth a door anchor will allow you to work your entire body as long as you ensure the door doesn’t open while your in the middle of a workout so leave a note on the door. Finally when all else fails use your body weight to burpee, mountain climb and plank your way to keeping fit on the road. Bottom line there are no excuses to keeping in shape while out of town if you’re creative and have a plan. Remember that just one workout per week covering all muscle groups will allow you to maintain your fitness level while away.